Since I’ve thrown out all of my pants and traded them in for dresses a year ago or so, I’m constantly on the hunt for flattering yet casual knit dresses to replace the jeans and t-shirt section of my wardrobe. I ran across Fleet Collection months ago, but somehow lost track of them until their Secret Sale notification popped up on Facebook a few days ago. The 20% off encouraged me to take the plunge, bringing a $68 dress down to $55. 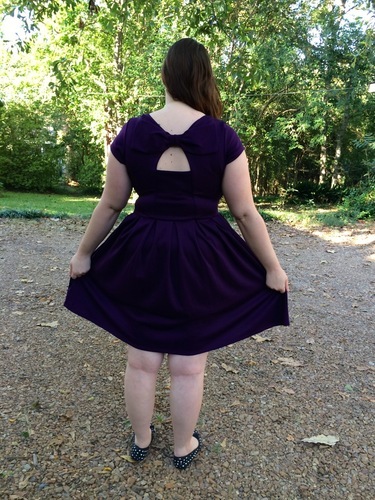 I haven’t read any reviews of Fleet Collection dresses, so I had no idea what the quality or the fit would be like. d) the fact that the dress was named after my favorite ever Holly – Breakfast at Tiffany’s was the movie that made me happy to be named Holly in the first place! I was thrilled to open the package and discover that the dress was far more than I expected – it is made of a nice solid fabric and beautifully made and finished on the inside. The fabric is thick enough that I think this will make a great year round dress if you live in a warmer climate – it’ll be perfect with a sweater and tights under it on colder days. This dress feels and looks far more expensive than it is. 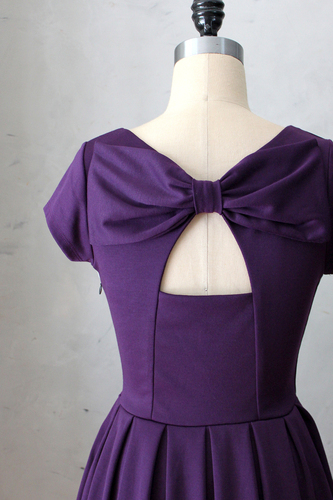 The Holly Golightly dress has a zipper, but I could also pull it on over my head with no problems. 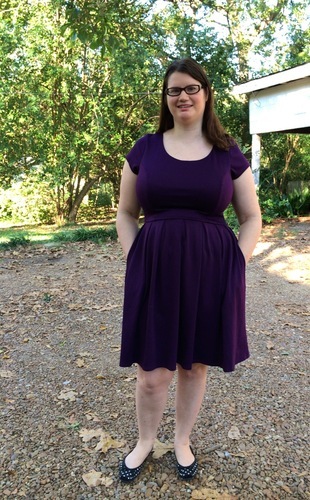 Not only is this dress full bust friendly, it’s got a feature that I almost never find in nice casual dresses – back interest, as Darlene would say! 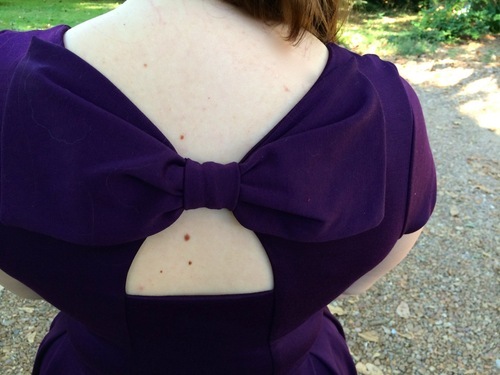 The cutout with the bow in back is pretty and interesting without overwhelming the line of the dress. I definitely want to try wearing it out with my hair up to show off the back a bit more. 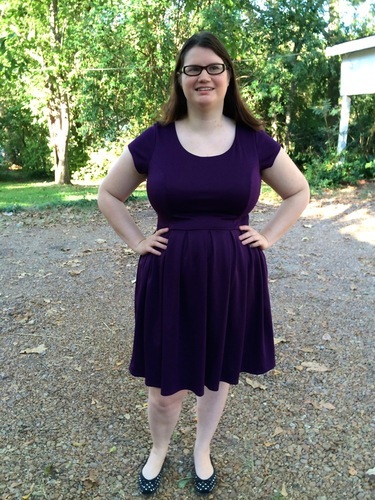 This dress also has hidden pockets, which is an incredibly useful feature in a casual dress. There is lots of great detail work on this dress for the price. The downside of Fleet Collection is that they don’t go beyond an XL, which is the size I bought. This dress would look great on plus size women and I’d love to see them offer an expanded range of sizes so everyone could take advantage of their offerings. They’ve now been picked up by Modcloth and other websites that sell a full range of sizes, so I’m hoping that may influence them to expand their offerings. I would absolutely buy a Fleet Collection dress again – in fact, I’ve already got my eye on several more possibilities. I love the Derica dress and think that the cutouts might actually work with a real bra! I may get brave and try it soon. What do you think of Fleet Collection? Have you tried them yet? Oh, that dress is wonderful on you! I do love the back!! Thank you! It’s really comfortable, but the back cut out makes it special.